Hungary retail sales turnover increased by 6.5% YoY in February, showing some deceleration and a downward surprise to market expectations. However, as this reading is around the last 6-month average, we don’t want to read too much into this slowdown. In the detail, all of the main subsectors in retail posted good figures, but only retail sales of automotive fuel showed acceleration, posting a 9.8% YoY increase, the highest reading since early 2015. Taking into consideration the first two months, this is the best start of the year in this subsector, which can be the effect of two things: a fuel price decrease in February and the general pick-up of economic activity affecting transportation. 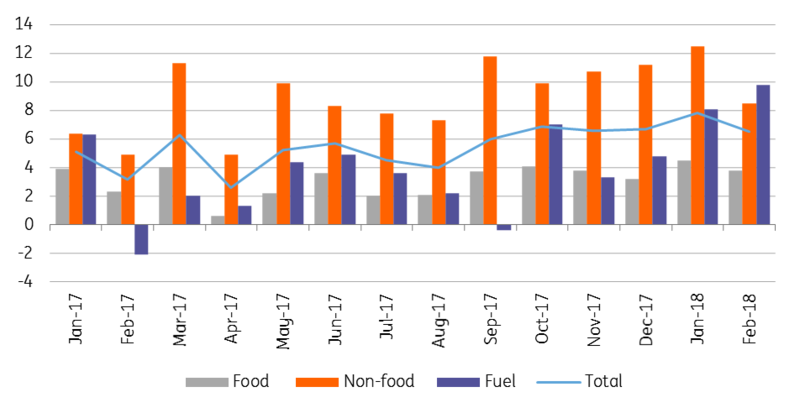 Turnover in food and non-food shops increased at a slower pace than in January, posting 3.8% and 8.5% YoY growth respectively. Retail sales have started this year better, than in 2017, but the turnover increase could be slower than in 4Q17. This can be changed by two facts: 1) the early Easter affecting consumer spending in March and 2) Hungary’s 2.8 million pensioners getting the government’s gift voucher worth HUF10,000 (EUR32) around the end of March.